Reinforce your messages and let everyone know your rules. Pool rules are essential to maintain safety. 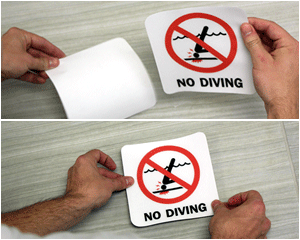 Post a notice about slippery steps, prevent diving, or mark shallow areas. • Markers are made from anti-skid, anti-slip material. Laminated vinyl is tough enough to last for years. • Bright, bold black fonts on a white background. • Browse the markers below to match your important rules. Find every rule you need, from messages on swimwear and hygiene, to reminders about lifeguards and adult supervision.